Comprised of its old and new city parts, rural villages and picturesque resorts, the region of Paphos is home to some of the most stunning areas of natural beauty on the island. Due to its many historically invaluable archaeological sites, Paphos has been declared a UNESCO World Heritage Site as a whole as well as the European Capital of Culture for 2017. Larnaca has the longest continually inhabited region of Cyprus, with a history that dates back 4.000 years. And whilst it is rich in ancient culture, Larnaca is also a thriving and modern European city that offers the best of all world’s. Kato Paphos, centered around the quaint harbour and impressive Medieval Castle, Paphos’ environs then stretch to incorporate the tourist resort of Polis Chrysochous. The pretty and tranquil area – known simply as ‘Polis’ – has expanded to become a sub-district in its own right, and encompasses the beautiful Akamas National Park and Lara beach – which is a breeding site for turtles, and the traditional fishing shelter of Latchi. The most scenic sunset experiences in Paphos are found at ‘Petra tou Romiou’, the mythological birthplace of the goddess Aphrodite and at St George area. Kato Paphos Archeological Park: In 1980, UNESCO placed Kato Paphos archaeological site on its World Heritage Sites list. This was a catalyst for the creation of a plan for the protection and maintenance of all archaeological remnants as well as promoting them and offering detailed information to visitors. Kato Paphos Archaeological Park includes sites and monuments from the Roman period (most remnants in Cyprus date back to this period), the Middle Ages, and even prehistoric times. From all the finds, perhaps the most impressive is the fabulous mosaic floors of four Roman villas found tere. Additional spectacular monuments are; the Asklipieion, the Agora, the Odeon, the ‘Tombs of the Kings’, the ‘Saranta Kolones’ (Forty Columns) Fortress and the ‘Limeniotissa’ Ruins of an early Christian Basilica. The Tombs of the Kings are found in the necropolis of Paphos, close to the sea. They have inherited this title due to their size and grandeur. Some of these tombs likely belonged to the Pafian (of Paphos) aristocracy, and not royalty. They are hewn from rock and date to the Hellenistic and early Roman periods. Several tombs imitate the houses where the departed lived while alive, with the rooms (now burial chambers) open on to an atrium. They bear similarity with tombs found in Alexandria, which is indicative of the close relations the two cities had during the Hellenistic period. The island’s longstanding tradition of winemaking needs no further proof than its claim to the world’s oldest named wine still in production – that of Commandaria, proclaimed by Richard the Lionheart as the ‘wine of the kings and the king of the wines’. And whilst the same ancient grape varieties are still cultivated; and the same villages produce wine in the old, traditional ways, the island’s wine industry has also vastly modernised, progressed and expanded. Whether you’re a connoisseur or a simple lover of the drink that locals once worshipped as the ‘nectar of the Gods’, you will delight in discovering a host of charming wineries and wine growing regions along seven glorious wine routes. One of its most popular spots is the bustling promenade of Foinikoudes which is lined with palm trees and flanked by beach, restaurants and coffee shops. Its coast joins with the sea walkway of Piale Pasha – which passes by quaint old neighbourhoods and fresh fish taverns – whilst its parallel shopping centre puts everything at your fingertips, and is home to the grand cathedral church of Agios Lazaros. As the town’s Patron Saint, the story and monument of Saint Lazarus serve as an enduring symbol of Larnaca’s significant religious history. The mosque of Hala Sultan Tekke, built in honour of the Prophet Mohammed’s aunt, who died here after falling from her horse, is an important place of Moslem pilgrimage. Its minaret rises up amidst a copse of tall palm and cypress trees, shimmering like an oasis mirage on the edge of the salt lake. Thousands of flamingos stay between November and March, along with wild ducks and other water or shore fowl find refuge here on their migratory journeys. Archaeological finds show that the salt lake area and that of the nearby mosque have been inhabited since the Late Bronze Age (2nd century BC). In prehistoric times the salt lake was a harbour that served the town, unearthed near where the Hala Sultan Tekkesi mosque stands today. The town was one of the large urban and commercial centres of Cyprus in the Late Bronze Age (1650-1050 BC). When the town was abandoned, the estuary silted up and the natural harbour was destroyed. According to legend, the lake’s saltiness stems from St Lazarus’ request of an old woman for food and drink. She refused, claiming her vines had dried up, to which Lazaros replied ‘may your vines be dry and be a salt lake forever more’. A more scientific explanation is that the salt water penetrates the porous rock between the lake and the sea, making the water very salty. St. George Hotel offers the luxury you deserve, the myriad services and gastronomic delights you need, the exclusive modern design facilities you require, recently being renovated, including a brand-new & ultramodern in Roman Baths Style holistic Wellness & Spa” SENSPA”, with all the convenience you expect. Here the guest can travel from one world of beauty to another being spoiled and pampered with treatments from Thalgo, La Beaute Marine. Amorgos Hotel provides easy access to all the local activities and attractions on foot. It is surrounded by a wide variety of restaurants, cafes, bars and nightclubs as well as Larnaca’s shopping center. The hotel is only a few metres away from the famous Palm Tree Sea Front Promenade (Finikoudes Beach) and only 10’ minute from Larnaca International Airport. 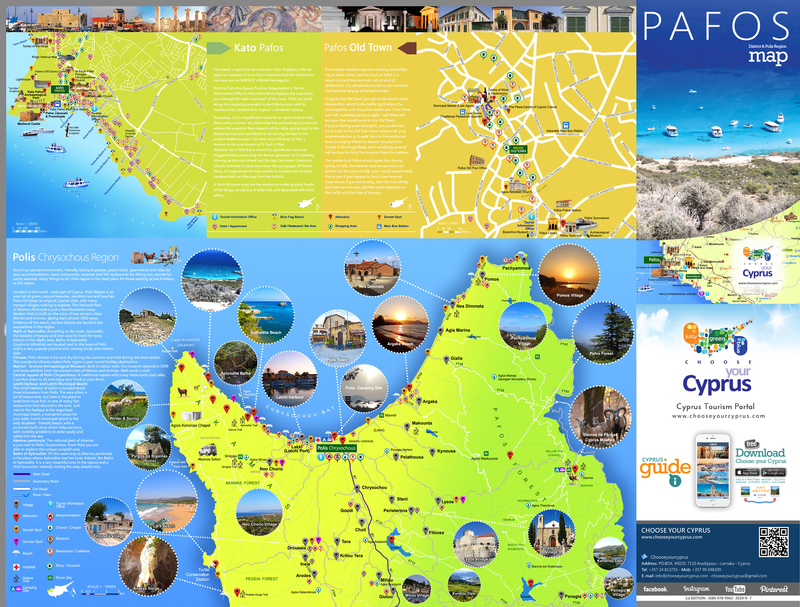 Where are Paphos and Larnaca located? Discover all the best places to visit and be ready to live the adventure.